So this year I vowed to make more breakfast foods. Like I’ve said many many times before, I love breakfast foods, just not necessarily at breakfast time. Dinner…um heck yes. I’ll eat omelets or eggs all day every day if I could. But I wanted to start eating more breakfast in the morning this year. Well donuts have always been sort of something I’ve been known for around my house. I absolutely love making super fun flavor combinations like these Strawberry Lime ones, or these Cranberry Bliss! Trust me when I say those are just a few among the ones I actually have on the blog. Just search donuts and you’ll see the fun collection! 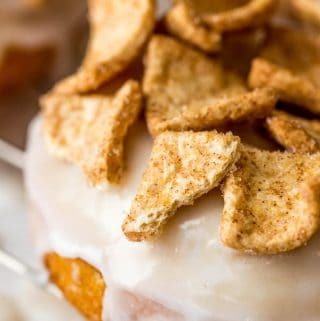 So I actually combined my love of cereal with my love of donuts and made these Cinnamon Toast Crunch Donuts! 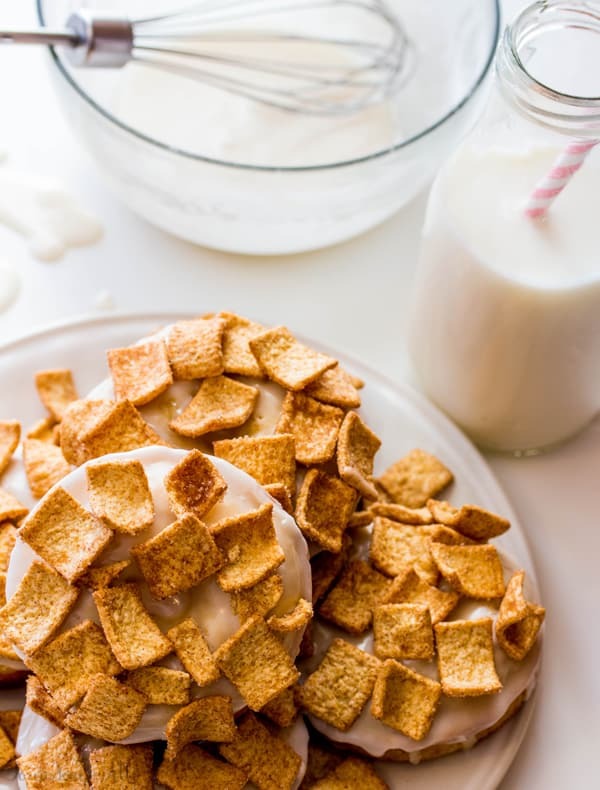 Let me tell you….these taste just like you’re eating a bowl of cereal! I love them! I might add that my sweets loving husband actually tolerated these quite well…meaning that he went in for multiple bites instead of just the unenthused bite I usually make him try! Besides me being an adult and literally swooning and wanting to eat my weight in these bad boys…my kids absolutely adored them. It usually don’t take too much effort to get my kids to enjoy a donut that I make, but when they ask you to make another batch for them, then it really tells you something. 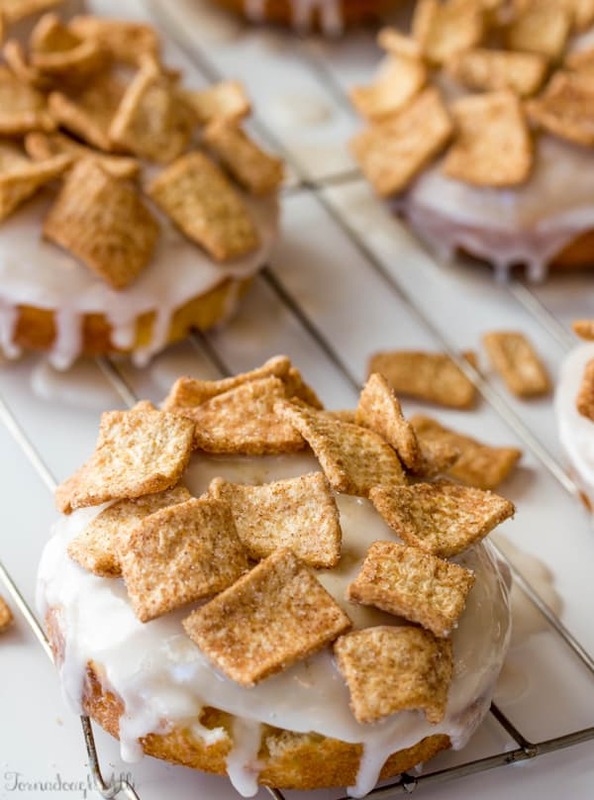 So these Cinnamon Toast Crunch Donuts are baked. I perfer to make baked donuts over the yeast ones. 1. They are quicker. 2. They have a 75% more success rate (for me) and 3. They are super super super easy! Like one bowl easy! And ya’ll know me and my LOVE (addiction) for easy recipes! Just because they are easy, does not in any way shape or form make them lack in flavor. Some of the simplest of recipes have been my absolute favorites! 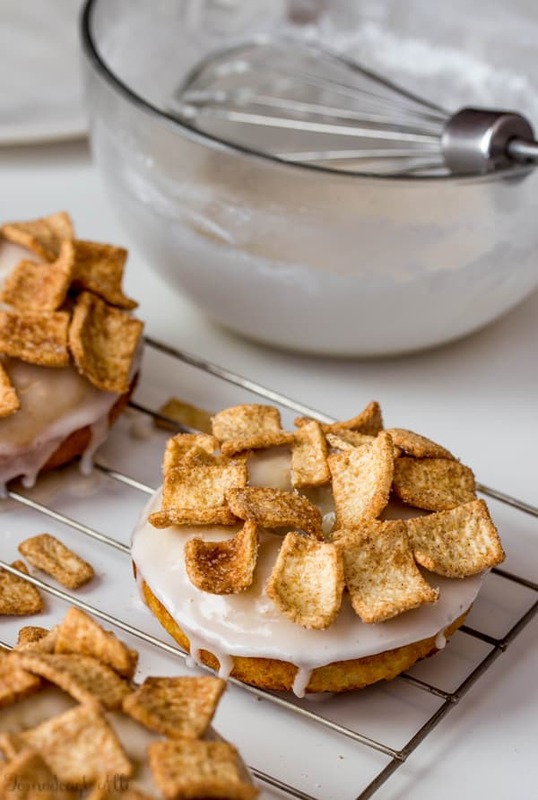 So let me just say these Cinnamon Toast Crunch Donuts are a fun, easy option for your next breakfast endevour. 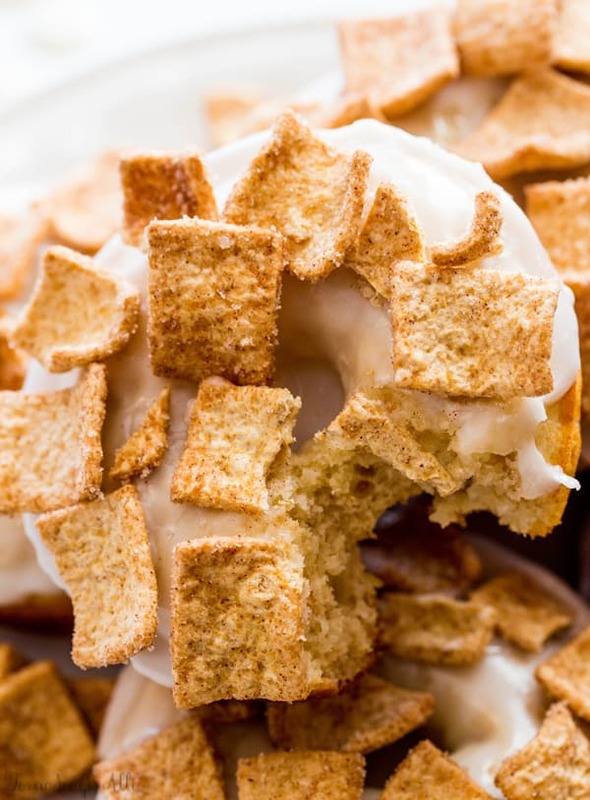 A fun cereal flavored donut that gives a different twist to breakfast time! Spray a 6 count donut pan with non-stick cooking spray, set aside. In medium bowl mix together your flour, cereal, baking powder, sugar and salt and whisk together until combined. Add in your egg, sour cream, milk, butter and vanilla and mix until combined. Transfer to a piping bag and pipe evenly into wells of donut pan. Bake for about 10 minutes or until golden and donuts pop back when touched. Remove from oven and place on cooling rack to cool. Meanwhile in bowl mix together our powdered sugar, milk and vanilla until smoothe. Once donuts are cool dip tops of donuts into glaze and place onto cooling rack and let sit for a few minutes then dip again. 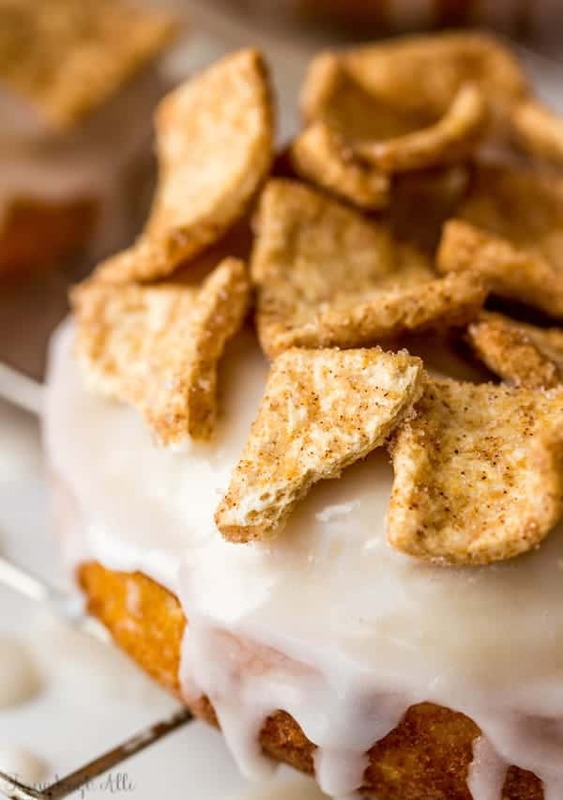 Top with Cinnamon Toast Crunch and enjoy!